In the comedy Little, a 38-year-old tech CEO, Jordan (Regina Hall), over-compensates for the middle-school bullying she suffered by becoming a mean boss. As her tormented assistant, April (Issa Rae) takes the brunt of it. In the film’s opening scenes, shot in glam-looking Atlanta, we see Jordan dish it out to her boy-toy, Kevin ( Luke James ), terrified employees, random baristas, car hops and adolescents who get in her path. The closest thing Jordan has to a friend is her impudent, Alexa-like virtual assistant, called Home Girl (Tracee Ellis Ross). Finally, an offended adolescent street magician waves a toy wand at her and wishes Jordan would become “little” again. The next morning Jordan wakes up next to her usual bottle of sleeping pills and half-drunk glass of rosé, to discover she has been transformed into a 13-year-old nerd, as punishment and an opportunity to de-Scrooge her mean self. If you think Little sounds like something a 10-year-old might come up with after seeing Tom Hanks’ Big, you would be entirely correct. The 10-year-old was Marsai Martin , who pitched the film’s premise to Kenya Barris, creator of the sitcom, Blackish (the series on which she Martin stars). Now 14, Martin is Hollywood’s youngest ever producer, overseeing a script co-written by director, Tina Gordon and Tracy Oliver (Girls Trip). 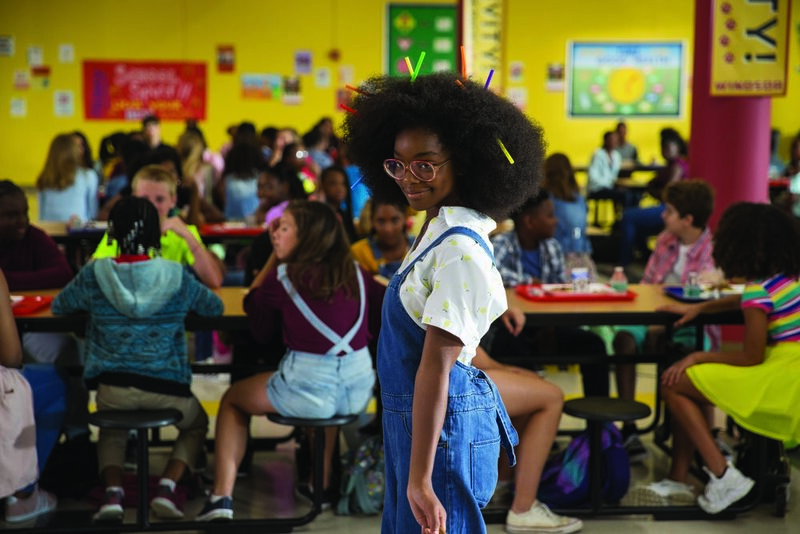 She also stars as the young Jordan, in medicinal-looking glasses and a lopsided afro, doing a good impression of a the junior-sized Jordan, with a swagger and knowing cocked eyebrow. Soon, Jordan convinces her April that she’s her old boss (Rae’s plays the same fidgety romantic as in her HBO series, Insecure) and gets her to act as her guardian aunt. In her boss’s absence, April has to step up at work, trying to close a deal with a pompous investor (SNL’s Mikey Day) and finding a chance to promote her own idea for an app. Meanwhile, Jordan discovers that, though fashions and phones have changed, mean girls are much the same. (Her chief tormenters in each era are played by the same actress, Eva Carlton). Though she can’t save herself socially, she can use her adult skills to inspire a shy multi-racial trio of fellow nerds to participate in a talent show. Little chases several comic formulas with diminishing rewards, getting downright squirmy in two scenes when the 13-year-old Jordan comes on to adult men. While the three stars’ charm distracts from some of logic and taste gaps, there’s an energy drop when Regina Hall and her appalling, fun grown-up character goes off-screen. The movie’s accept-yourself message feels like a low bar for a character of her ceiling-busting ambitions. Directed by Tina Gordon Chism. Written by Tina Gordon Chism and Tracy Oliver. Starring: Issa Rae, Regina Hall, Marsai Martin, Rachel Dratch and Mikey Day. Little shows at the Cineplex Yonge-Dundas, Cineplex Yonge-Eglinton, and the Cineplex Eglinton Town Centre.